Mactan Island is known for its export processing factories, mass production of musical instruments, an international airport and a diverse collection of tourist attractions. These things makes it a viable place to live in and is considered as Philippines’s most densely populated island. But this economic and social boom couldn’t be made possible without the help of infrastructure, the Mandaue-Mactan bridges. The two Mandaue-Mactan bridges paved way for the island to be easily accessed from the mainland province of Cebu. Both bridges have become iconic landmarks of Cebu. It connects Lapu-lapu City to Mandaue City, another progressive city in Metro Cebu, across the Mactan Channel. Let’s take a look at these two bridges and its brief history. Its official name is Mandaue-Mactan Bridge but when the second bridge was constructed, it is more commonly called as the First Mandaue-Mactan Bridge or the Old Bridge. It is 846 meters long (2,775 feet) and 9 meters wide (29 feet) and is categorized as a box truss type of bridge. The construction costs 65 million pesos which began in 1970 and was inaugurated in 1972 during the term of the late President Ferdinand Marcos. One impressive fact about it is it was wholly designed and created by Filipino engineers. During the Sinulog Festival in Cebu, people flock on top of the Mandaue-Mactan bridge to witness a very special and sacred activity. It is the Fluvial Procession of the Senor Santo Nino from Mactan to the mainland Cebu. Aboard a galleon, the Holy Image of the Child Jesus will cruise along the Mactan Channel and under the first bridge. Several motorboats and bancas will follow the galleon which a great sight to see from the top of the Mandaue-Mactan bridge. People on top of the bridge to witness the fluvial procession. Do you know that this bridge initially had toll booths on both sides? It was until the late 1980’s when the toll fee collection was stopped. The toll booths were then demolished and removed which makes the travel across the bridge smoother. Eventually, the volume of people and vehicles rose which led to the congestion of the first bridge. To help ease the problem, the second Mandaue-Mactan Bridge was constructed. It is named after a former senator and Chief Justice of the Philippine’s Supreme Court, the late Marcelo B. Fernan. The bridge has a total length of 1,237 meters (4,058.40 feet) with a center span of 185 meters (606.96 feet). The Marcelo Fernan Bridge began its construction in 1998 and opened in August 1999 during the term of former President Joseph Estrada. It is an extra dosed cabled stayed type of bridge and is considered as one of the widest and longest bridge spans in the Philippines. This was made possible with the help of the Japanese Government as a symbol of friendship between the Republic of the Philippines. One great feature of the bridge is the walkway on both sides of the bridge which makes it safe for pedestrian to walk across the bridge. Because of this, it is also a favorite spot for joggers because of the slope which is a good exercise and training routine. At night, you can have a wonderful view of the Marcelo Fernan Bridge lights from a mini-park underneath situated on the Lapu-lapu City side. The mini-park has benches for people to chill and enjoy the sea breeze while some even jog around the walkways. The night lights of Marcelo Fernan Bridge. But wait, there’s more! Do you know that a third bridge, with a span of about seven kilometers, is on the work? A proposed P16.88-billion Cebu City – Cordova bridge project officially broke ground on January 1, 2015 on Shell Island, Cordova town. 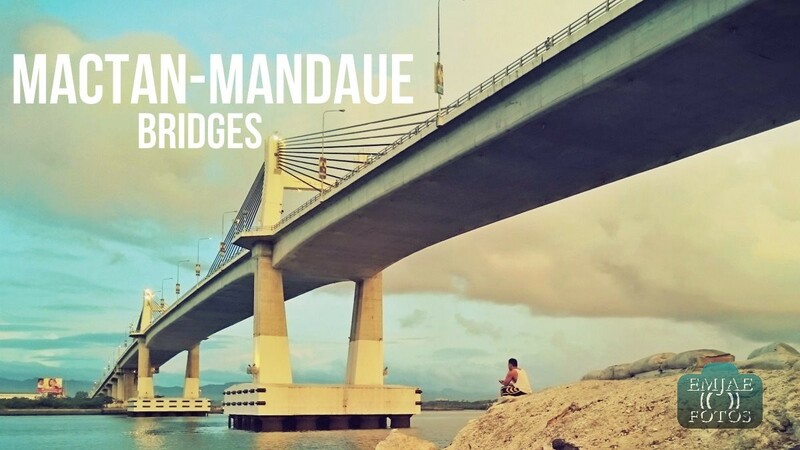 The Mandaue-Mactan bridges have greatly facilitated the transport of people, goods, services and opportunities between Mactan Island and mainland Cebu. A third bridge would surely help decongest Mactan Island, again, and a good sign of economic development in Cebu. I just hope for the success of this project as well as the welfare of our environment and natural resources.